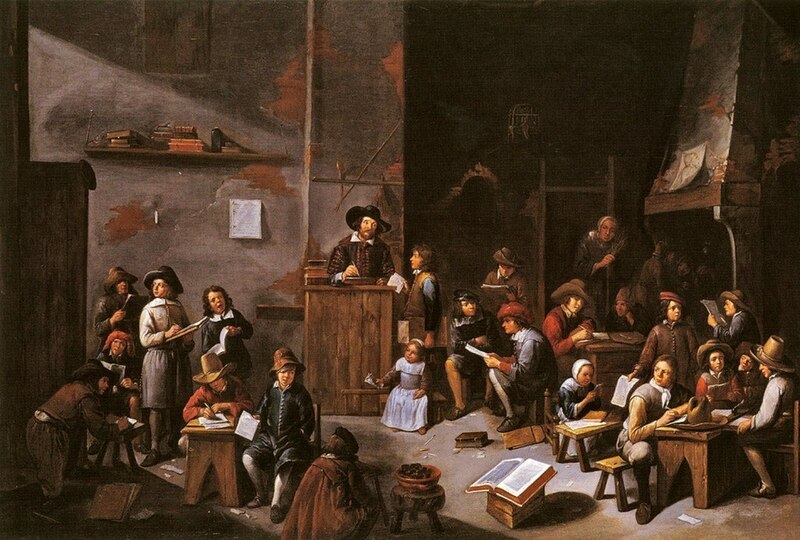 Paintings of school life by Dutch and Flemish artists of this era reflect changing views on childhood and the role of elementary education as a necessary part of moral growth. Van Tilborgh’s scene offers a window into a typical schoolroom of the day. Most classes were large, with the older children expected to help the younger ones. Students reported to the teacher’s desk to have work checked. Children are reading and writing, their sober expressions reflecting the importance of their task. Behind the teacher are a rod, ferule (a flat ruler with a widened end to punish children), and switch, tools of discipline. The open birdcage suggests that some of these children are preparing to leave and enter adulthood. His composition owes much to the style of his teacher, David Teniers II. Van Tilborgh is remembered for genre scenes and paintings that merge genre with the idea of the group portrait.